Last night for Day 6 of the shows at the Mercedes Benz Fashion Week. I am becoming more and more emotional by the day, partly because I’m here every day and I’m getting attached to this beautiful man-made fashion hub in Malta’s Capital and because the week is soon over and I know I will miss seeing all these lovely people every day including the photographers who greet us, the ladies making the Nescafe coffees, all the management ladies at the entrance greeting us with a smile and a compliment and seeing Adrian J Mizzi buzzing around the place like a bumble bee, checking every detail and making things happen. It was my immense pleasure on Day 6 to wear – for the first time in my history of attending local fashion weeks – a tailor-made trouser suit which was by local designer and award-winning couturier FIONA VELLA. The response from the moment I started to upload teaser images on my Instagram story videos of my make up and hair look, it was something out of the ordinary in terms of social media engagement – also a first for me. I could almost not cope with replying the hundreds of messages that were coming in every minute – “Wow! Beautiful! Stunning! Magnificent!” Thank you!! It was pretty overwhelming, probably a mix of the peak attention from 6 days of being here and attracting a constant follow and also the look which has hit some strings of yours! 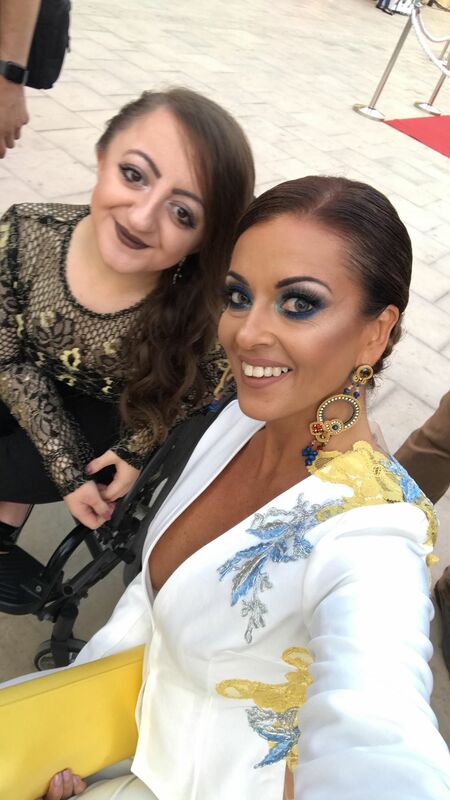 The make up was by Janice Baldacchino, a very talented up and coming make up artist who I ve been working with for almost 3 years now and I just love her work. The hair was done by Anthea and the team at Mixa’s Salon, pulled up in a sleek upstyle using some of my #TRESEMME hair products #WORKIT with a pretty design including braids merged into a bun to complement the look, yet leaving all the focus on the workmanship of the lace and the suit itself and the make up look inspired by Malta’s Blue Lagoon. Loved how it all came together in the end, many hours of trials, research and talent by many local people. #TogetherIsBetter always! The photos shot by Justin clearly show the fabrics and the neat workmanship of this piece and I felt great wearing trousers. I will wear them more often after this! 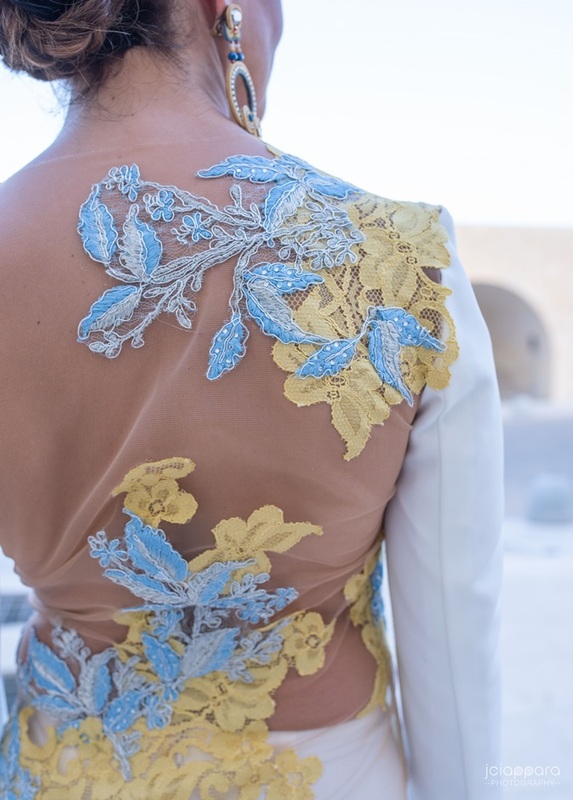 The lace detailing at the rear and the arm gave it that unique touch making it a striking piece, ideal for fashion week and any important event or occasion in the summer or winter months. I am one of those blessed with a sun kissed glow type of complexion all year round, thanks to my parent’s Italian/ Maltese genes, so I can pull off wearing white any time of year, which is great. 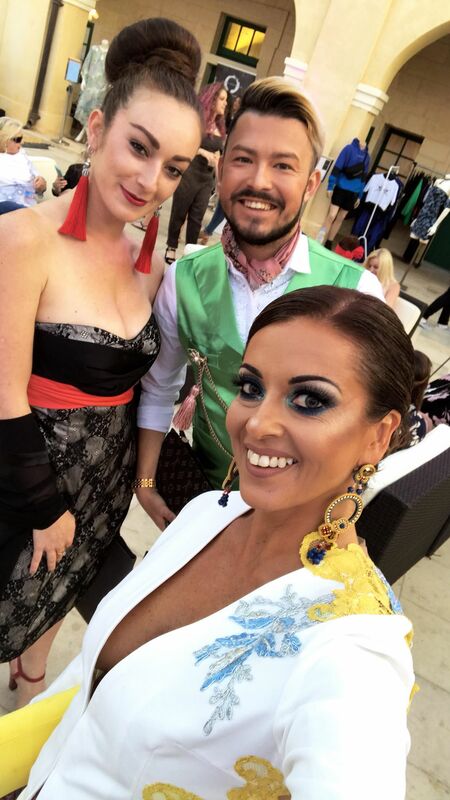 The accessories included an elegant designer pair of earrings sourced from La Boutique at Palazzo Parisio, the yellow satin bag and the diamante ring were from Porto at the outlet at Hilton Malta. Shoes are by Desiree Azzopardi. For me it has been all about the extra details this year in my looks so for this look I had grey lenses in my eyes to create a more mesmerising look in the eyes. How do you like me in this colour eyes haha. It was also an experiment which turned out to my favour. In life, it’s great to take some risks. Some will hate you and some will love you but if you don’t try, you will never know. I choose to try, even if I fail, because I can get back up and be stronger than before, filled with new experiences – and a story to tell to my family and child.